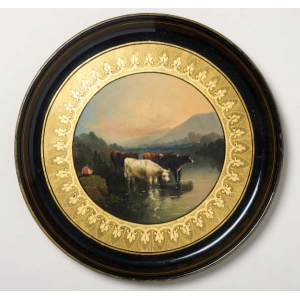 Summary: Circular serving tray, painted with cattle watering and a fisherman within a gilt border. 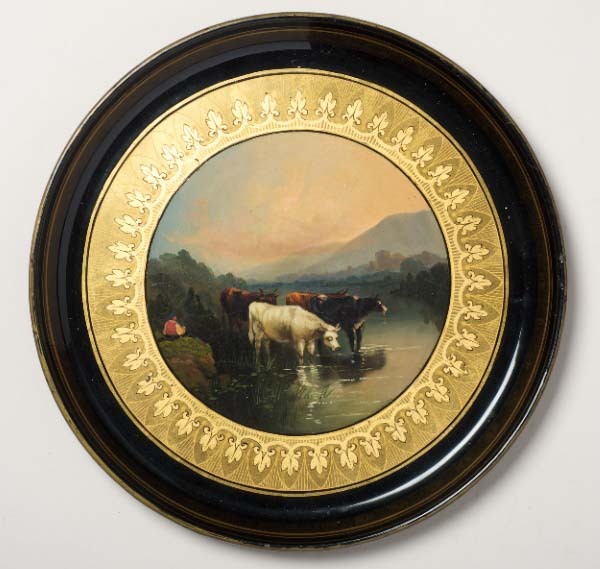 Description: The image on this tray depicts an idyllic rural scene of a man fishing while cattle drink from the river nearby. The scene has been painted directly onto the tray's black lacquered base, showcasing the high level of skill and talent of the artists employed at the Wolverhampton japanning factories. The tray is made of tin, a common base for japanned pieces. Many utilitarian household objects were constructed of lacquered tin. However, the detail of the painting and the gold leaf border on this particular piece show it to be a true luxury item.